Rama is one of the playable Gods in SMITE. Ravana's immortal reign subjugates the people. Shiva's boon grants the demon-king invulnerability against gods and beasts. Only mortal men stand a chance of defeating him, but Ravana's might is too potent for a mere man to overcome. All seems lost. When a neighboring kingdom, cursed by Ravana's magic, asked for aid, Rama answered, despite the misgivings of his father. With his brother Laksharma, Rama set out and slew a horde of demons. At the palace, Rama cleansed the curse by freeing the queen from stone. The city celebrated and Rama was invited to string Shiva's bow – with the prize princess Sita's hand in marriage. Shiva's bow could not be lifted by any man, let alone strung, but Rama broke the bow in half. He and Sita wed immediately. Returning home, Rama was to be crown prince, but the jealousy of queen Kaikeyi forced Rama into exile, where he's remained these past fourteen years. Yet Rama was recently seen on the field of battle. Word is, Ravana stole Rama's wife, and Rama left exile to embrace his destiny. He must defeat Ravana, free his wife, and set mankind on a path for peace, else darkness and evil will conquer all. 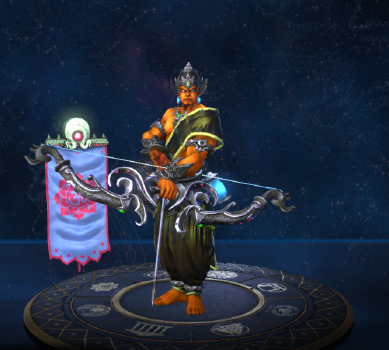 Rama switches to a more powerful arrow that pierces and slows enemies. This ability consumes 1 of Rama's Astral Arrows and deals bonus damage with every shot. Damage from this ability is reduced to 75% for each enemy hit after the first. Rama cannot toggle this ability if he has no Astral Arrows. The slow can be stacked up to 3 times. Passive: Any time an enemy is hit by an Astral Arrow there is a % chance that an Astral Arrow pickup will appear on the ground (Only procs on the first enemy hit by Astral Strike). The pickup adds one Arrow to Rama's Astral Arrow count. Active: Rama gains increased attack speed. Drop chance for Arrow Pickup: 10/20/30/40/50% Attack Speed Increase: 30/35/40/45/50% for 5s. Rama will fall down as soon as the 3 arrows have been used, or after 5s have passed. Rama is untargetable for the duration. Can deal up to 450/675/900/1125/1350 (+135% of your physical power) damage. Kill or Assist Lane Minions or Enemy gods to gain stacks. Lane Minions are worth 1 Stack and Enemy gods are worth 5 Stacks. At 75 Stacks Hunter's Blessing Evolves, gaining 15% Attack Speed and an additional 15 Bonus Basic Attack Damage. Basic Attacks against an enemy reduce your target's Physical Protection by 12% for 3 seconds (max. 3 Stacks). You permanently gain 15 Mana per Stack, and receive 5 Stacks for a god kill, and 1 Stack for a minion kill (max. 50 stacks). Additionally, 3% of your Mana is converted to Physical Power. Critical Strike damage is increased by 30%. Every fourth Basic Attack triggers a chain lightning, damaging the target and up to 4 nearby enemies for 30 damage +60% of your total Basic Attack Power. Successfully Hitting an Enemy with a Critical Strike will subtract 2s from all of your abilities currently on Cooldown, except your Ultimate ability. This effect can only happen once every 5s. Absorbs a single hard Crowd Control effect or Root once every 70 seconds. When this occurs, the owner also receives 1s of Crowd Control immunity. When hit by a Slow, you are immune to Slows and your movement speed is increased by 20% for 4s. Only occurs once every 30 seconds. Using this item makes you invulnerable to damage and healing for 1.5s, preventing you from taking actions. You may still move. Using this item Slows the Movement Speed of all enemy gods within 35 units by 30% for 5s. Their Attack Speed is also reduced by 15% for the duration. This consumable increases your Physical Power by 30 for 5 minutes or until you are killed. Also, your abilities deal bonus damage of 15% of your Physical Power to gods. This effect can occur once for each god hit with the ability. Critical hits on enemy gods afflict them with poison for 2s. This poison slows them by 15% and reduces their damage output by 15%. As Rama kill two enemy gods while in your ultimate. As Rama cripple 3 or more enemy gods in a match using Rolling Assault. Rama's directed taunt towards Hun Batz, "He seemed... familiar. ", could be a reference to Hanuman, a god devotee of Rama who is usually depicted as a monkey. Rama's skin Orbital Strike was originally going to be called FutuRama to reference the TV series of the same name. Rama's skin Last Commando is a reference to the Rambo film series. 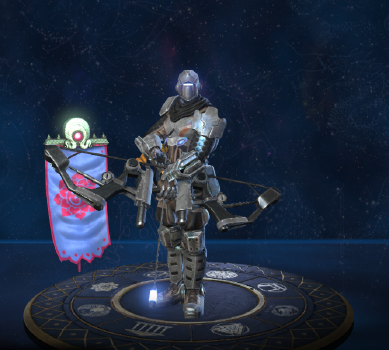 This skin comes with custom character animations and ability effects. This skin comes with custom ability effects. This skin was part of the Odyssey 2015 event. This skin could also be obtained as a rare roll from the Dignitas Chest. 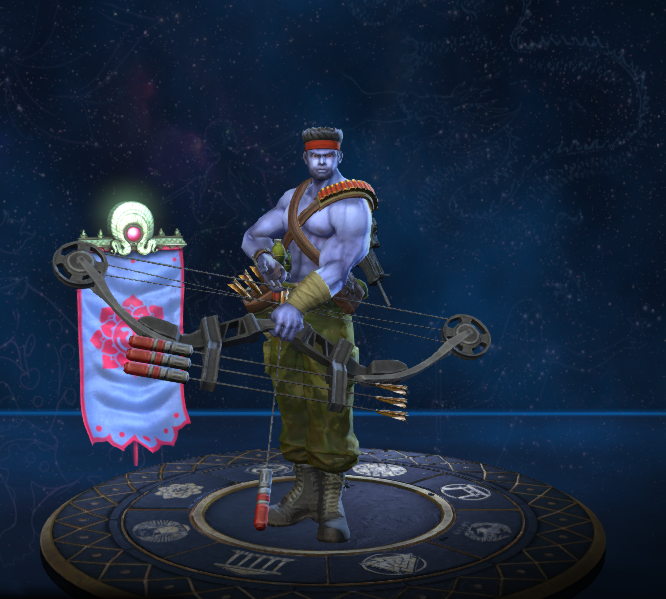 This skin can only be obtained as a rare roll from certain Treasure Chests. This skin could only be obtained as a rare roll from certain Treasure Chests. Adjusted the FX for this targeter to help it remain visible to the player firing, while also conveying the amount of shots left. Decreased Bonus Damage from 15/25/35/45/55 → 10/20/30/40/50. Cooldown increased from 12/11/10/9/8 → 11s at all ranks. Increased bonus damage from 10/20/30/40/50 → 15/25/35/45/55. Increased Slow duration from 1s → 2s. Increased rate of Astral Arrow regeneration from one arrow every 15s → every 12s. Reduced mana cost per arrow from 25 → 20 per arrow. Fixed Rama unable to use Basic Attacks if running out of Mana while Astral Strike is active. Fixed bonus damage not applying if fired at point blank range. 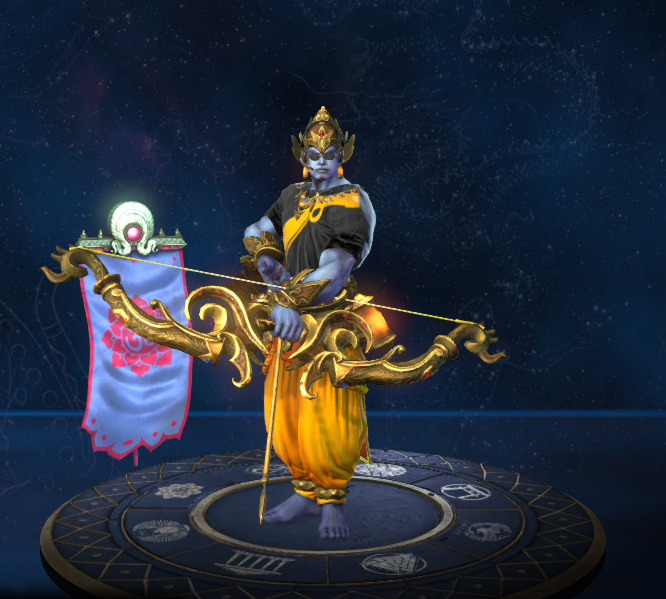 Fixed an issue where Rama would become Knockup/back immune. Fixed the Piercing sound fx not playing. Added timer on the ground targeter indicating when the ability will expire and Rama will be forced to land. Added new sound and fx for when Rama picks up the dropped arrows. Base Attack Speed increased from 0.92 to 0.95. Attack Speed per level increased from 1.4% to 1.7%. Damage from this ability is now reduced to 75% for each enemy hit after the first. Fixed an issue where Astral Strike could be disabled during Astral Barrage. Fixed Diamond card using default image background. Fixed a condition where an Astral Arrow gained while using this ability would not deal bonus damage or cripple when consumed. Reduced base damage from 250/350/450/550/650 to 200/300/400/500/600. Reduced physical power scaling from 80% to 60%. Fixed an issue that caused the camera to stay zoomed in after coming down from the sky. Fixed an issue with his ability targeters starting out faint and loading in over a short time. Slow now stacks up to 3 times, changed from 20/25/30/35/40 to 10% at all ranks. Now costs 25 mana per shot. Fixed a number of icon, messaging, sound, and tooltip issues. Basic attacks have had their effects updated to originate from his bow instead of his stomach. Improved visual FX dropping and picking up Astral Arrows, and what Astral Arrows look like while firing. FX added to bow to indicate when Astral Strike is in toggled on state. Fixed an issue with this ability dropping astral arrows. 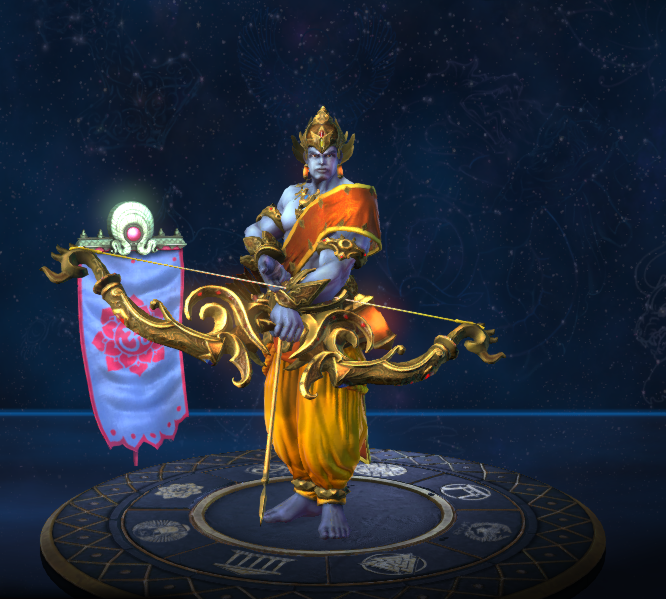 Fixed an issue where Rama would have infinite arrows. Fixed an issue with ranks 1-4 slowing for 2s instead of 1s. Fixed an issue where the ability can't be toggled with less than 9 mana. Rama's allies can no longer pick up his arrows for him. Fixed rank 2 applying a slow. 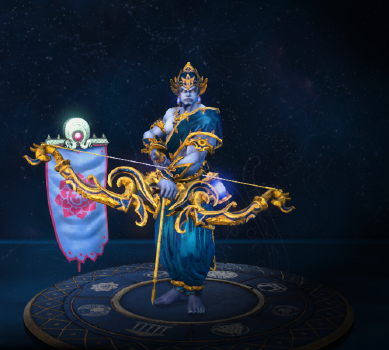 Rama has been added to the game. This ability now does item on-hit effects only for the first target hit. Items like Golden Bow will not trigger for every enemy in the line. This ability now does 100% lifesteal on the first target hit. Bonus damage now applies to objectives. 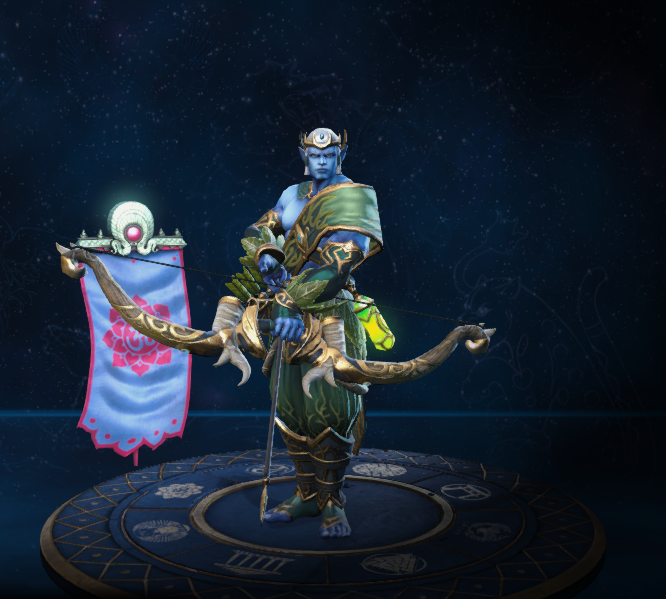 Rama’s teammates can now pick up drops of Astral Arrows for him. This page was last edited on 12 April 2019, at 07:20.